Earlier this year, Chopard co-CEO Karl Friedrich Scheufele’s young brand Ferdinand Berthoud released an interesting new regulator-style watch, the Chronomètre FB 1R.6-1. Inspired by the Marine Chronometer No.7 made by the brand’s namesake Ferdinand Berthoud more than two centuries ago, the Chronomètre FB1R.6-1 features a tourbillon and fusée-chain movement in a hardened carburised stainless steel case. It uses a variant of the base Calibre FB-T.FC but now reworked to introduce a regulator style with a digital hour, and the same large sweep seconds hand present in the FB 1.1. 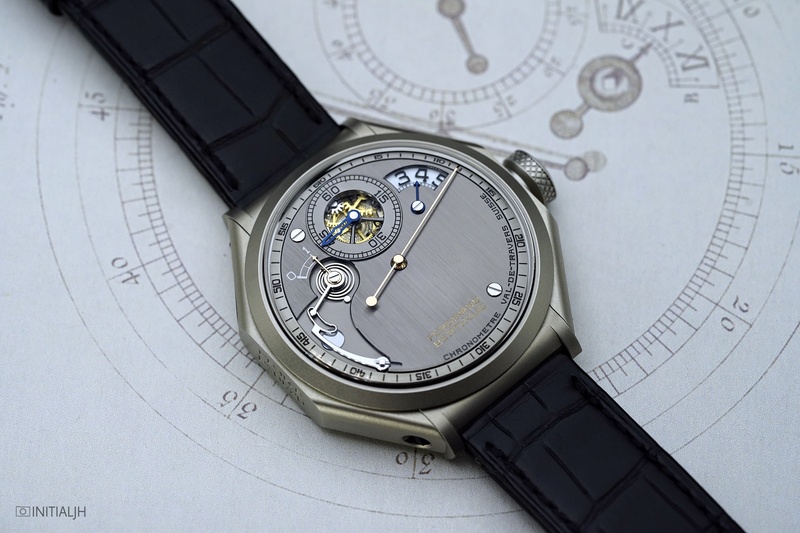 This movement, the COSC-certified FB-T.FC.R (with the ‘R’ standing for ‘regulator’), is made up of 1,158 components, beats at 3Hz, and has a power reserve of 53 hours. There are two small openings on the sides of the case through which you can see the stainless steel fusée chain, which has 790 components, all of which are individually hand-finished. In fact all the parts of the movement, including the German silver bridges and plates, are hand decorated/ finished. This fusée system is equipped with a Maltese Cross stopwork, which protects the movement by limiting the winding of the mainspring to six turns, and acts as a buffer when the barrel is fully wound. There is also a crown device that ensures that there is no damage from over winding. The large (15.66mm diametre) one minute tourbillon, with its titanium carriage, hand-polished and chamfered bridge, and blued skeletonised hand, has sixty-seven components. However, the FB 1R.6-1 does not have its tourbillon opening on the dial side, a design decision which forms a large part of why its look is so distinctive and to my eyes at least, forms part of its appeal. The unusual dial layout of the FB 1R.6-1 has its functions concentrated at the top, leaving the bottom, unadorned. This allows the vertically satin-brushed (by hand) black rhodium-plated nickel silver to become as much a focal point as the indications. Although the hours disc (a sapphire disc with Arabic numeral transfers), minutes, and power reserve are in close proximity, there is no sense of them being cramped; the functions are all clear and legible. The thin gilded bronze central seconds hand, which is linked to the tourbillon, is not just an interesting feature, but also acts to visually break up the dial expanse. The inner bezel ring, made of black rhodium-plated, bead-blasted and chamfered nickel silver, provides a graduated progression from the dial to the colour, material and texture, of the case. The 44mm sized case (13.95mm thick) is reinforced steel with a hardness of 1,200 Vickers, and corrosion resistant. For those of you who are familiar with Sinn’s tegimented steel used in many of their watches, it is also 1,200 Vickers, which gives you a good idea of how durable the FB1R.6-1 is. It’s a clean design, and the combination of the satin-brushed dial and reinforced steel case gives it an attractive industrial edge. This regulator design is said to have been first seen in a drawing published by F. Berthoud in ‘Traité des Horloges Marines’ (1773), which also had a large central seconds hand and a digital hour disc display. Coming on an alligator strap with a titanium folding clasp, as is the case with all of Ferdinand Berthoud’s watches, this edition is limited in production, with 20 pieces and an RRP of 198,000 EUR. A chain-and-fusée watch is a rare horological beast nowadays, let alone with a tourbillon. 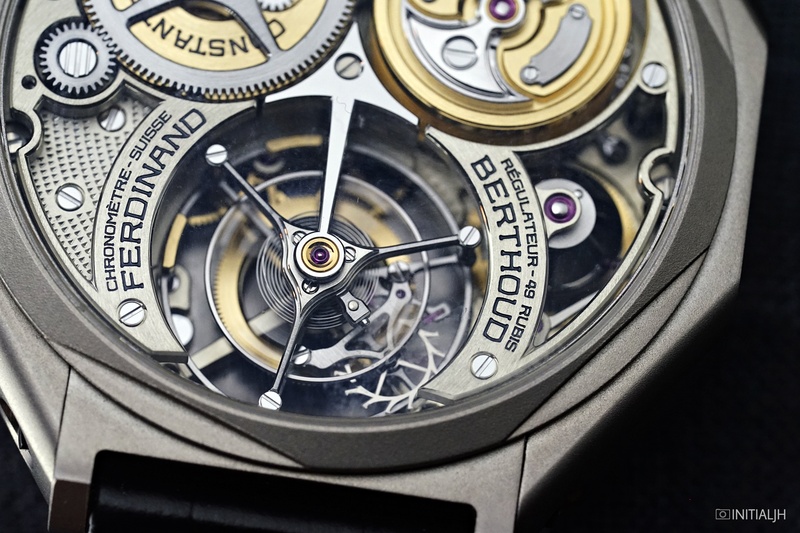 Ferdinand Berthoud’s Aiguille d’Or at the 2016 Grand Prix d’Horlogerie de Genève gave this niche high-end brand a boost both in terms of brand awareness and in terms of industry acknowledgment of what they were doing. The Chronomètre FB 1R.6-1. (now also released, since we saw this model, in an even more limited bronze case cements their commitment to movements, and to a distinctive design character that immediately distinguishes the brand from others.